I focus most of my ire on the federal government because bad policy from Washington is the biggest threat to our nation’s freedom and prosperity. But we also get plenty of bad policy from other levels of government. I periodically focus on the foibles of states such as California, Illinois, and New York. Today, though, let’s contemplate the inane policies of local government. I’ve shared plenty of examples in the post, even to the point of putting together two contests (here and here) to pick the craziest action by a local government. Politicians and bureaucrats in cities and towns do lots of big things that are bad, such as creating massive unfunded liabilities, providing crappy schools, turning law enforcement into back-door tax collectors, and trying to turn children into wusses. And they do lots of small things that are bad, such as shutting down children’s lemonade stands, arresting people for saving rafters from drowning, fining people for rescuing children from savage dog attacks, leaving a dead body in a pool for two days, requiring permits to be a bum, poisoning water supplies, and paying bureaucrats not to work for 12 years. As reported by the Chicago Sun-Times, here’s an example of Chicago cronyism. A real estate venture created by President Barack Obama’s onetime boss and a nephew of former Mayor Richard M. Daley squandered $68 million it was given to invest on behalf of pension plans for Chicago teachers, cops, city employees and transit workers… The five public pension funds haven’t made a dime on the investments they made nearly a decade ago… In fact, the financially troubled pension plans have lost most of the money they gave DV Urban… Though the pension funds lost out, DV Urban and its affiliated companies got about $9 million of the pension money for management fees. Not that this should be a surprise. Being a Daley relative has commonly been a route to undeserved riches. And the same can be said about being an Obama crony. Speaking of government greed, here are some excerpts from a very depressing Forbes column about shakedowns of poor people in Los Angeles. An unbuckled seat belt caused Gloria Mata Alvarado to lose her driver’s license. When her husband was driving Mata to a doctor’s appointment for her gastritis in August 2012, her stomach began hurting. For relief, Mata adjusted her seat belt. But a police officer saw her take off the belt and cited her. …In court, Mata was ordered to pay $712, almost half the monthly income for her and her husband. (Both are on disability.) After telling the judge that she couldn’t pay the fine because of her limited means, a judge graciously reduced the fine—to $600. Unable to pay, her license was ultimately suspended. …In Los Angeles County alone, nearly 200,000 drivers had their licenses suspended simply because they failed to pay fines or appear in court. Statewide, from 2006 to 2013, the California Department of Motor Vehicles suspended more than 4.2 million driver’s licenses for those reasons… Throughout the Golden State, motorists are routinely nickeled-and-dimed in traffic court. Looking to raise revenue, state lawmakers slapped on additional fees and surcharges to the base fines for traffic tickets. For instance, the fine for failing to signal or running a stop sign is $35. But after all the surcharges and fees have been imposed, that fine soars to $238. Likewise, a $20 ticket for using a cell phone while driving balloons to $162, while a $100 traffic ticket for failing to carry proof of car insurance actually costs $490. Even worse, failing to pay can trigger an additional $300 “civil assessment” fee. So for many low-income Angelenos, a $20, $35 or $100 ticket can easily become $462, $538, and $815 respectively. …Notably, the courts themselves receive the collected civil assessment penalties, granting them a strong financial incentive to levy fees. This sickens me. I hate the thought of poor people having their lives made worse because of venal and greedy government. Especially when many (probably most) of the infractions are for things that don’t actually promote or protect public safety. At the very least, the fines (and accompanying fees) should be slashed. Though I recognize this could result in more cities being like Detroit, which actually spends more administering parking tickets than it collects in revenue. Maybe the answer is to levy fines based on income. If a lot of middle class and rich people suddenly experienced severe financial discomfort like the poor, that might generate enough pressure to shut down these revenue-raising scams. Let’s now travel up the coast to enjoy a classic case of government incompetence from San Francisco. last year, SFMTA officials excitedly unveiled the first of sixty brand new electric trolley buses purchased by the city of San Francisco. …these $1.1 million-a-piece vehicles were touted as a crucial investment in a public transit system still running buses 20-plus-years old. There’s just one problem: The 60-foot buses can’t go up San Francisco’s hills. In fact, the buses were never designed to handle our iconic hills — anything over a 10 percent grade wears down motor components. …the New Flyer buses also struggle to meet Muni’s internal acceleration standards on inclines of 5 to 10 percent — sometimes taking double the time during tests to accelerate to required speeds on the slight inclines. But at least the buses are electric, which means they have zero emissions, so the nitwits in San Francisco can feel virtuous (though it does require them to pretend electricity magically appears from nowhere rather than emissions-producing power plants). This story reminds me of the streetcar boondoggle in DC. Now let’s go to another city famous for bad policy. New York City has been padding its budget by ticketing cars that are parked legally. As of late 2008, in NYC you can park in front of a sidewalk pedestrian ramp, as long as it’s not connected to a crosswalk. …I’ve got a pedestrian ramp leading to nowhere particular in the middle of my block in Brooklyn, and on occasion I have parked there. Despite the fact that it is legal, I’ve been ticketed for parking there. Though I get the tickets dismissed, it’s a waste of everybody’s time. And that got me wondering- How common is it for the police to give tickets to cars legally parked in front of pedestrian ramps? What the reporter discovered is shocking. …thanks to NYC’s Open Data portal, I was able to look at the most common parking spots in the City where cars were ticketed for blocking pedestrian ramps. …What I found when I dove into the data surprised me. To start, I found the top address where this ticket were given: in front of 575 Ocean Avenue in Brooklyn, where over $48,000 in parking fines were issued in the last 2.5 years. … the spot, (or really spots since there are two ramps), are legal, since they are in the middle of the block, with no crosswalk. $48,000 in tickets at a legally parked spot, and that is just the last 2.5 years. The next top spots on the list had the same story to tell. 1705 Canton Avenue in Brooklyn, 273 Tickets, $45,045: Legal. 270-05 76 Avenue in Queens, 256 Tickets ($42,440) Legal. 143-49 Cherry Ave, Queens, 246 Tickets, ($40,590). Legal. …I started to skip down the list. This spot in Battery Park, ranked #16 on my list and the top spot in Manhattan, had 116 tickets ($19,140) and turned out to be legal. …I started to skip down the list faster and faster. Take #1000 in my top list, at 1059 Virginia Avenue, where 8 tickets had been given ($1320). It is a classic T intersection, meaning it’s legal. …I then selected 30 random spots that had received 5 or more tickets over the time period, and based on Google Maps found that all of them appeared to be legal parking spots! The good news is that this exposé supposedly is forcing the city to stop this type of illegal ticket, so some stories actually do have a happy ending. The next step hopefully will deal with extortionate fines for the horrible crime of…gasp…idling for more than three minutes! But not all stories end well. Here’s a jaw-dropping report of bureaucratic abuse from Sarasota, Florida. At 90 years old, Marie Louise Sikorski has lived in her house on Webber Street in Sarasota for most of her life… The city found several code violations at her home. Since then, she’s racked up massive fines, which she says add up to about 150,000 dollars. As a widow receiving only 1,000 dollars a month…, she says there’s little she can do. …That’s when 30-year-old Miles came into her life. …As her neighbor, Miles heard about her situation and began to help with repairs around the home, sometimes putting in 16 hour days, all free of charge. This sounds like a happy ending, right? A greedy local government hits a senior citizen who is too old to maintain her house with massive fines, but a wonderful neighbor steps in to save the day. You’re probably thinking the local government then waived the absurd fines. …the City is still not satisfied, and she says she’s still being charged 500 dollars a day. …Sarasota requires much of the work to be done by a “licensed” contractor, something Miles is not. In other words, we get a sad end to the story because of a mix of two ugly things, routine government greed and oligopolistic government licensing restrictions. Reminds me of the disgusting actions of the local government in Montgomery, Alabama. Last but not least, let’s close with a classic story of wasteful spending. A local politician in Portland, Oregon, squandered tax money taking her staff to a luxury spa in Arizona for supposed diversity training. Commissioner Amanda Fritz says she will close her office next week to take her six staff members to a retreat in Arizona to learn about diversity at a cost of roughly $40,000. Fritz and her staff, about half of whom are people of color, plan to spend at least 3 1/2 days in Tubac, Arizona, near the Mexican border, participating in a diversity workshop put on by a Portland-based company, White Men as Full Diversity Partners. …The program charges $4,750 per person for tuition, lodging, meals and site fees. Fritz’s office will also have to pay for the staffers’ flights to Arizona. Though, to be fair, Commissioner Fritz is not the only Portland politician to rip off taxpayers for this type of scam. Former Mayor Charlie Hales drew criticism for spending $56,000 to send 16 white, male city employees to a resort on Mt. Hood in 2014 for another workshop put on by the same organization. The City of Portland has spent more than $126,000 on programs and consulting from White Men as Full Diversity Partners since August 2014, according to city invoice records. As you might expect, there are some sketchy connections between the city bureaucracy and the contractor. Office of Neighborhood Involvement Director Amalia Alarcon Morris worked as a paid associate for the diversity organization more than a decade ago… The diversity company still lists Alarcon Morris as a consultant on its website. By the way, I fully expect that a search of campaign finance records would reveal that the owners and managers of White Men as Full Diversity Partners have recycled some of the loot they’ve received into the campaigns of Portland politicians. The politicians win with campaign contributions. The bureaucrats win with a free vacation. The contractor wins by getting a big check. The only losers are…you guessed it…the taxpayers! The moral of the story, as explained by Veronique de Rugy in a column for Reason, is that governments at all levels are venal and incompetent. What do home Bible study classes, transgender bathrooms, lemonade stands, cat litter, and marijuana have in common? To the blind eye, not much—but in fact, they’re all things state and local governments are actively working to regulate. …it turns out local governments are frequently the worst offenders of all when it comes to petty tyranny. …Dozens of places, including Austin, Texas; Sacramento, California; and Thurston County, Washington, have banned supermarkets, convenience stores, and pharmacies from providing customers with free plastic bags. “Many cities restrict the economic freedom of their residents and potential migrants through minimum wage laws, business licensing, rent control, and zoning restrictions,” Mercatus Center state and local policy expert Adam Millsap explains. And many of these regulations, particularly zoning and occupational licensing laws, place a disproportionate burden on poor people and minorities. And she points out that decentralization, while theoretically very desirable, won’t generate many benefits if misguided federal policies are replaced by bad local policies. 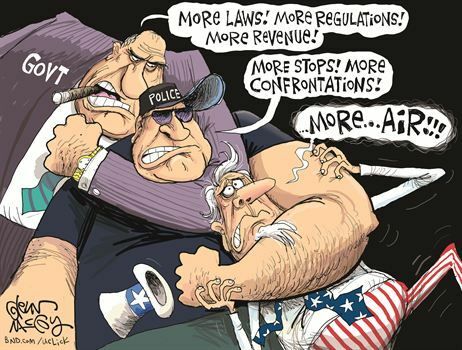 Many on the political right believe that the devolution of power to lower levels of government can help overcome problems created by centralized authority….In a 2014 paper, George Mason University economist Richard Wagner explored whether federalism really supports liberty. He found that devolving power to lower levels can be good for individual freedom under the right conditions—but it’s far from guaranteed. P.S. Don’t forget to vote for Veronique in the “most influential libertarian” contest. And you don’t even need to make it a write-in vote. She’s been added to the list by popular demand. P.P.S. I suspect most people won’t care about what’s happening with my local government, but local politicians and bureaucrats are whining about belt-tightening even though spending has climbed much faster than inflation. 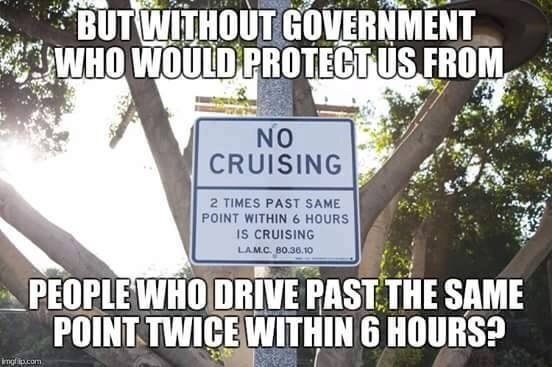 That no cruising sign reminds me of Virginia beach, VA from years ago. They might still have them. Makes a real pain for the pizza delivery people.